Yesterday was exhausting, but also exhilarating. It has recently been confirmed that the Mayor will be supporting my Pacific Solo Row – in particular he will be a VIP presence at a couple of my events throughout the year! Make Sundays Special is one of his popular new initiatives – one that focuses on people, community and sustainability for a day, rather than allowing cars to dominate the city centre – and it was a privilege to be able to be a part of the third Sunday that this has run. Armed with a fantastic new banner, donations boxes, bowls of sweets and two rowing machines, we headed down into the city centre early yesterday morning to set up. The aim of the day as to spread the word about the challenge and the charity, to raise some money, and to have fun – all of which we achieved. We set up two rowing machines, and set people the challenge of rowing 200 metres as fast as they could. There were some very close races, as friends and family battled it out against each other to be the fastest. There was even a set of twins who finished with only a second between them. It wasn’t only about the fit, strong and fast though – as it was such a short distance the 200m Pacific Challenge appealed to everyone, from three-year olds to grannies. Even the security guards couldn’t resist having a go! Winners of the various prizes and categories will be announced later on this week, with prizes ranging from VIP tickets to the launch party to a VVIP tour of the boat for the under-14s. We’re already starting to think about the next one – what we’d do differently, how much easier it would be with a few more people to help out (food and toilet breaks would have been good), what prizes we’ll offer next time, etc. 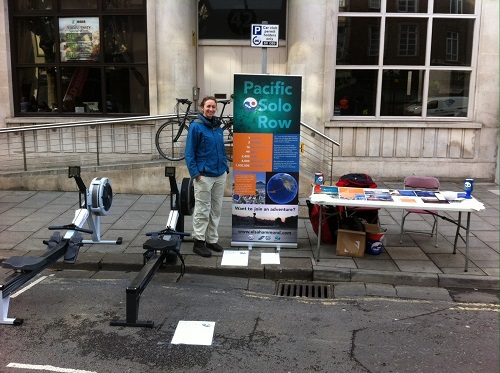 Thank you to the University of Bristol Sports Centre for the loan of the rowing machines, and to everyone who came down to Baldwin Street to take part and to chat to us. It was great to meet so many enthusiastic and interested people! 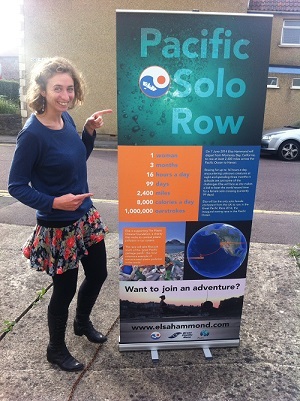 Previous PostBristol Half MarathonNext PostBristol Green Capital: Elsa’s amazingly big Pacific challenge! Congratulations! This is great. Fully behind you Elsa!